I am linking up with Sandra at SANses again. She's a mom of two boys from Singapore, and I am loving all the things we have in common. Isn't it just weird and awesome that someone on the other side of the world can have the same joys and problems that you have? She wrote a wonderful post today on the personal choice to have more children, and I can so relate to this post. I love children and would have a dozen if I knew I could give each and every one the life that I think they deserve! I waited four years to have my second child because I didn't want to jeopardize my goal of giving my first child our undivided attention during his babyhood and also because I wanted to do as close to the same as possible for our second and subsequent children. Perhaps if life had handed us a few different circumstances, we would have tried for the second child earlier, but I don't regret for a minute our choices. The first four years with Evan were such a joy, and the last two years with Brody have been more than double the joy. We have been able to take them both on exciting adventures and give them the fun childhood that I had planned for them. Anyway, I feel like as a working mom, I have different concerns than most stay-at-home moms, but I think most moms have the same overarching goals. As a working mom (and one going to school at night), I have to be mindful of making the most of my time with my children. Sometimes, I think it makes me appreciate the time I do have with my children more, and for that, I am thankful. I understand that being a stay-at-home mom is hard work because I did that for over a year with Evan. You are constantly cleaning, organizing, preparing food, and feeding children. And the house is never clean because people are always in it messing it up! During that time, I still tried to make the most of my special alone time with Evan, but I felt like sometimes I was so exhausted from all the other household duties that I still didn't fully appreciate the time I had with him. When I went back to work, the house didn't constantly need cleaning because no one was in it all day. I could leave my work at work and come home to just be with my family. Of course, we still had laundry and cooking to do, but it just felt less like a daily chore. For example, we can do all of our laundry in one day (my husband and I can share this task easily since we both work) instead of doing a load everyday and feeling like it is never done. On Sunday afternoon, all of our laundry baskets are empty, and the last load is probably in the dryer while we all rest and prepare for the week ahead. And we immediately hang up and fold our clothes when they come out of the dryer to save on the added task of ironing (that's one I hate and despise). Our weekends are usually "busy," but they are filled with fun times together as a family. We use those times to just appreciate one another and do special things together. During the week with work and school, everyone is always in a set routine of going to school and work, coming home, eating dinner, taking baths, and getting ready for bed. There is very little time for any deviation in this schedule anyway. In other words, whether you are a mom who works outside the home or a stay-at-home or work-from-home mom, I just encourage everyone to appreciate the time they do have with their children and prioritize that time to put those you love first. I promise, you'll enjoy your life so much more! Have a great Thursday, ya'll! It is difficult to juggle everything we have to do as moms and families. I just posted how I had some plans for this summer and now school is starting on Monday!! I regret that I didn't always make the best use of my time with my older children. And I sometimes beat myself up over it.... But I have come to the realization, I can't be all things to all people all the time. SO with that I have to do my best to make each day matter and if at the end of the day I have guilt over that day.... I chose to start over the next day and do my best to do better. The best advise I can give to any Mom sahm or working..... do what God wants you to do as a parent and don't waste any time comparing yourself to other moms. Its not worth the effort! Have a great day!! Haha! Yep, I guess so! 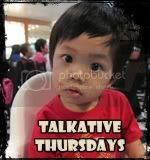 I love doing the Talkative Thursdays because it gives me a reason to "talk" and get things out.